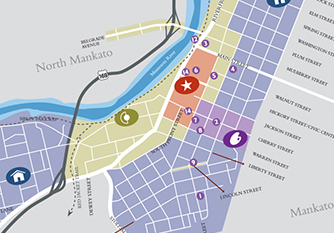 Business on Belgrade (BoB) is sponsoring an Adult Easter Egg Hunt on Saturday, April 13, 2019 on Belgrade Avenue, North Mankato to support the Twin Valley Council, Boy Scouts of America. 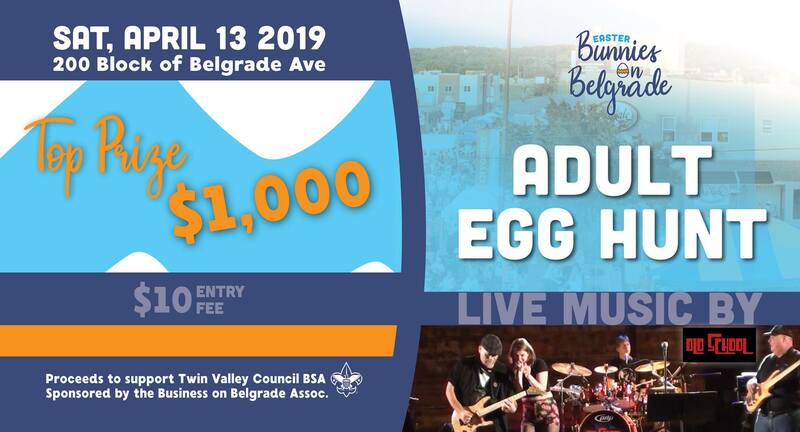 Over 2,500 eggs will be dumped from the back of truck onto the 200 Block of Belgrade Avenue at 6:00 p.m. To participate, purchase your $10 ticket from any of the retailers listed on back of this flyer. Festivities start at 4:00 p.m. with many food and drink specials, live music, and more! Over 100 prizes will be awarded with the top prize being $1,000 CASH! Your $10 event fee will allow you to take part in the Easter Egg Hunt. Take your eggs into area establishments to claim your prize(s). You can also purchase tickets at Neutral Grounds and Design and Wine, both located on Belgrade Ave! For more information, you can contact Ray Brauer at 507-387-3123 or ray.brauer@scouting.org. The Boy Scouts of America, Twin Valley Council is a 501(c)(3) charitable organization.